Now, before we even get to the story, let me preface this by saying I didn't watch the debate. I've been very vocal in the fact that my television does not go to Fox News and it will not go to Fox News even to cover a debate for this website. I know I promised to cover the GOP debates for my readers, but even I have my limitations when it comes to things that I will do. 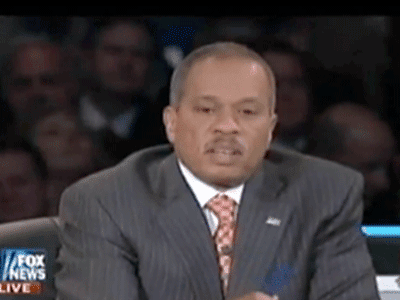 During last night's Fox sponsored GOP debate, there was a fiery exchange between candidate Newt Gingrich and moderator Juan Williams on the issue of some statements the former speaker made about minority students being given janitorial jobs. What resulted from the exchange was a standing ovation from the audience for Newt Gingrich. The whole exchange began when Williams brought up Newt's comment about black people needing to demand jobs instead of food stamps because we all know that the only people on food stamps is black people...SMH! The fact the Newt's response got a standing ovation should not come as a shock to anyone. Newt knew who he was talking to and he made sure to throw the crowd some red meat that they definitely tore into. Watch the exchange for yourself. I have not watched one of the debates. I read the fact checks and other posts about what was said. I am pro employment opportunities for young people. It is the type of employment that was suggested that straight up pissed me off. Instead of suggesting that youth clean buildings, why not work towards placing them in job positions that actually can lead to a possible career path? Newt is engaging in covert race talk and it's just too obvious. But what about all the poor white folks? Are they going to be filtered into the menial jobs as well. I'm already tired of the stump. It's going to be ugly and I'm just hoping that it doesn't get too far out of hand. covert race talk... that is BS. Why don't you stop playing the race card, stop making excuses, check the facts, and demonstrate some real care for our people!!! The whole attitude toward education, rap, "this job is below me" are disgusting and ruining us. Why can't you just get off the plantation and think for yourself?